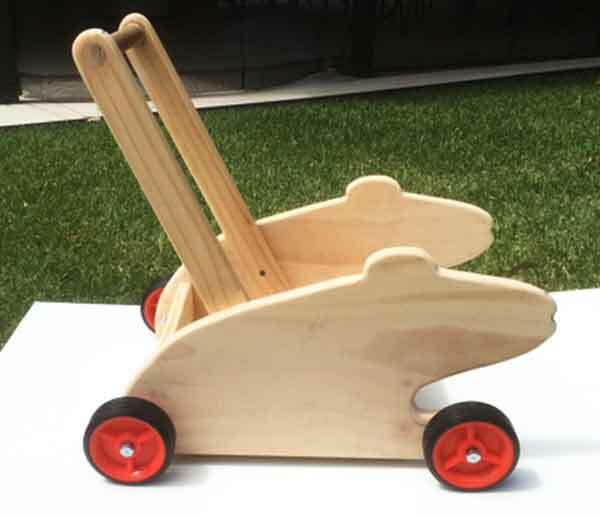 Thanks to Mark Joines from Australia for these plans for a toddler walker, which he designed and built for his granddaughter Genevieve. 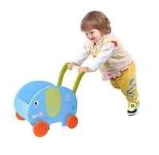 Mark first contacted me via my website asking if I had any plans for a toddler walker. At this stage, I did not have any, so did a quick search and found a few designs that might fit the bill. I found a few, and sent him a copy. "That's great," he said, "I can use the dimensions, but I'm looking for something like the elephant in the picture below." "I'm thinking along the lines of maybe your frog (in the frog puzzle.)" This is the frog in the frog puzzle. I wrote back to say that sounds like a good idea, and pretty soon Mark sent me a sketch of the frog shape that he was working on. I’m not sure how he did it, but it arrived as an Excel spreadsheet over three pages, and it was slightly elongated, and minus the baby frog on it’s back. Mark sure does work faster, because while I was still thinking about how it would all fit together, he sent me this photo of the toddler walker assembled and ready for painting. 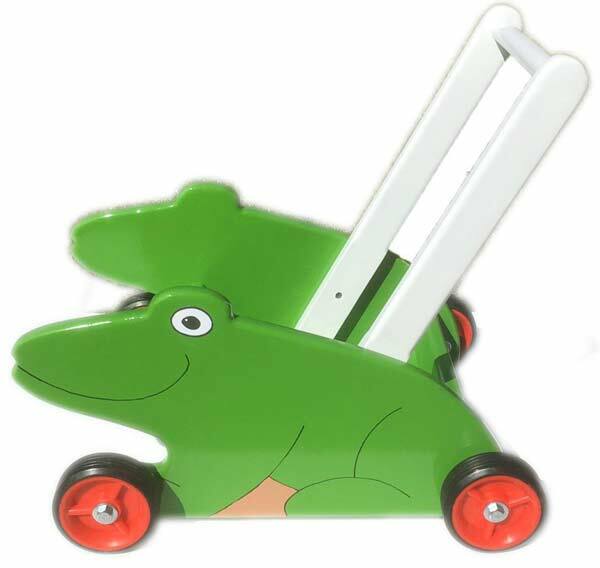 Something to cut curves, such as a band saw, jig saw, or even a scroll saw. An electric drill for drilling holes for the wheels. A router with a straight cutting bit to suit the thickness of the floor, and a 6mm round over bit for the edges. Not on the list, but something to consider when buying the wheels is bolts to suit the axle hole in the wheel. The length should be long enough for the wheel itself, the thickness of the timber and three washers. 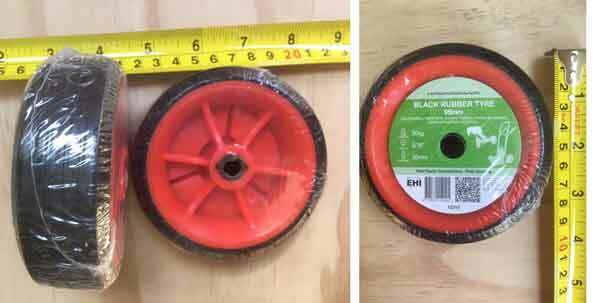 These are the 95mm diameter wheels that Mark used, they cost about $4.60 from Bunnings. Apparently there are some cheaper ones at about $3.20 each, size 100mm but the tread is not as wide. 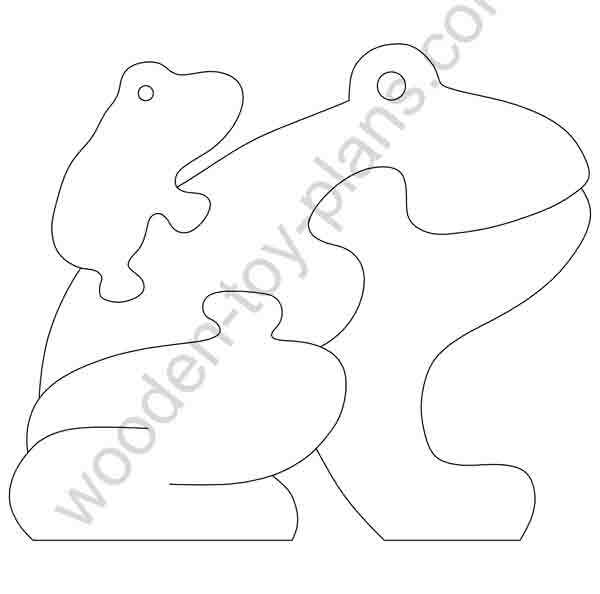 Mark is happy to share the plans to build this wooden baby toy, complete with building instructions and photographs, and full size templates. Ask me anything - use this contact me form if you have any questions. "Hope people enjoy making Kermee as much as I have." - Mark Joines, Australia.